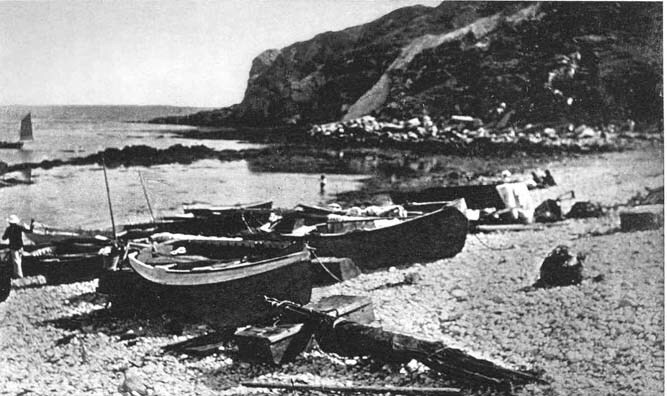 A late-Victorian or Edwardian photograph of Lulworth Cove. Click on image for a larger picture and more information about the connections to Hardy's work. The literary connexion with a place closer to Hardy's own home animates the dialogic "At Lulworth Cove a Century Back." Instead of transporting Keats to the present as in "At a House in Hampstead" Hardy in imagination transports himself back to the Channel cove, perhaps to dramatise the lack of popular recognition Keats would have received on the occasion of his landing there in September, 1820. Geniuses walk among us, but sometimes it is only after their deaths (Van Gogh is a fine example) that their true merit receives appropriate acclaim. "At Lulworth Cove a Century Back" seems a more vigorous and personal tribute to Keats as Hardy equates himself with the unknowing countryman impatient with the omniscient interlocutor (the present-day Hardy?) who knows both what will befall the young poet at the end of his journey and how future generations will reverence his memory as the thousands of Catholic pilgrims who travel to Rome annually venerate the one who denied Christ three times and then went on to lead His Church, as Thomas Hardy, descended from Dorset folk, went on to become one of England's greatest poets with John Keats as his shining example of what might be achieved in verse. Situated about 8 miles east of Weymouth is Lulworth Cove--a cove which has a very smooth, almost semi-circular shore-line. The geology of the area is most unique with exposed twisted rock strata indicating the once violent forces which shaped this corner of England. . . . .
Stair Hole, just to the west of Lulworth Cove, is a remarkable small cove with natural arches cut into steeply-dipping Portland and basal Purbeck limestones. Through these arches and a gap where one has collapsed the sea enters to erode the softer parts of the Purbeck limestones and shales. Although the illustrator has provided an example of such erosion just left of centre, the plate's version of the cove does not contain the "miniature Pillars of Hercules" at its moth, a peculiar feature that Hardy would mention later in "The Romantic Adventures of a Milkmaid" (The Graphic, 25 June 1883), when he describes the place where the Baron has anchored his steam yacht. Clearly, then, Lulworth or Lulwind Cove was a numinous place for the younger Hardy, and one may wonder how much the Keatsian connexion played a part in Hardy's interest in both his prose and verse. To accommodate the intertextuality of Hardy's poem about the Wessex coast and Keats' sonnet one should place them together.